A variation of the Happy Diamonds line, Happy Hearts is another passionate serving from master jeweller Chopard. Spinning diamonds and an abundance of love with the many hearts, the collection speaks the language of romance. 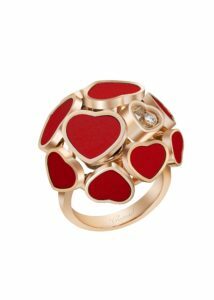 With this scintillating cocktail heart ring, a symbol cherished by Caroline Scheufele, the creator of the both these collections; Chopard has outdone itself. In 18ct rose gold, this piece comprises one heart with a mobile diamond, surrounded by fiery coral hearts, a precious expression of the modern women’s freedom of spirit and irrepressible joy. A ring for the woman of your heart.